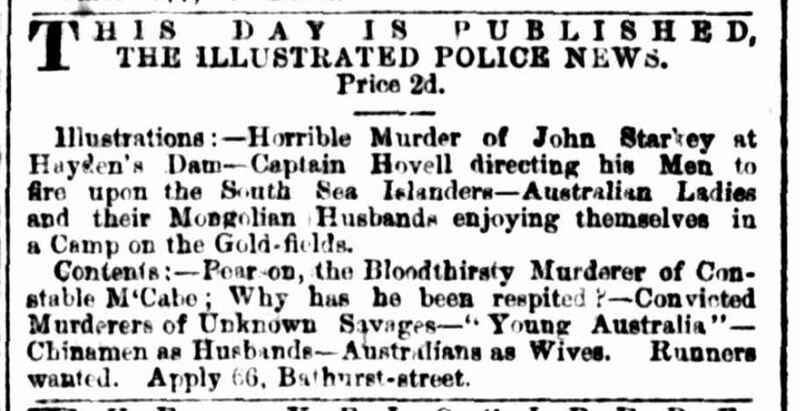 I’m intrigued by the prospect of an illustration showing ‘Australian Ladies and their Mongolian Husbands enjoying themselves in a Camp on the Gold-fields’ – but have not been able to locate it. The ad appears among those advertising other newspapers published in Sydney at the time – Bell’s Life in Sydney, the Protestant Standard, the Protestant Banner – all of which I can find extant copies of. But I haven’t been able to locate any reference to a newspaper called the Illustrated Police News published in Sydney at this time. There is, of course, the infamous London newspaper of the same name and a Melbourne Police News, illustrations from which are held by the State Library of Victoria. I’ve had some trouble accessing the British Library’s digitised newspapers site, which includes copies of the London Illustrated Police News, to check, but I’m pretty sure the Herald reference is to a different paper. Hi, note that the 19th Century British Library Newspapers database doesn’t include issues of the Illustrated Police News (London) from 1869 (starts with issues from 1867), so you might have to try to track down copies on microfilm if you want to check it. Trove is down at the moment so I can’t check which Australian libraries have it on microfilm or in print.